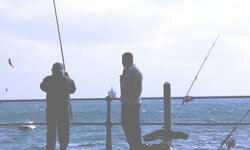 To promote the sport of Sea Angling with rod and line and to seek to be connected or affiliated with other similar bodies throughout the world. To encourage the study of fish for the sake of whatever pleasure, information, conservation, or other benefit it may provide. To establish and maintain standards of ethics for the Sport of Sea Angling and to agree rules governing the sport in Europe, especially in Championships,Festivals and Competitions of all kinds. To provide information, as appropriate, to interested persons or organisations. To establish and maintain a duly attested list of European Sea Fish Records under the appropriate headings of Boat, Shore and Line Classifications. To encourage the keeping of national Sea Fish Records by all members on the same basis. To keep a watching brief on all commercial fishing interests in European waters and take appropriate action when and where necessary, either directly or in concert with other interested organisations. As I have said, these appear somewhat grand, but underneath these words is the wish for all anglers to be able to enjoy their sport, and for the Federation to assist them in this goal whenever possible. Once you have had the opportunity of exploring our site I hope you will feel that the Federation can offer you an extension of the pleasure which I am sure you derive from your hobby. If so, why not contact your country’s Section and learn about their activities, as well as those of the Federation. Mention this site, as the feedback is of value to us, or alternatively complete the enquiry form in the site. Over the thirty or more years that I have been a member of EFSA I have derived much pleasure, and made many good friends through the Federation, and I hope this is something that you can share in the future. Join us and see what we are all about, and I am sure you will want to continue your involvement. As we say in EFSA “Tight Lines”, and we hope to hear from you. England, Belgium, France, Holland, Denmark, Norway and Scotland. Within six months of it’s formation no less than 16 countries were represented in the Federation, either by formation of member sections or affiliation of existing clubs. The objects of the Federation, as laid down at the time of it’s formation and still in force today, are to promote the sport of sea angling and maintain the list of European Sea Fish Records, and to keep a watching brief on all commercial fishing activities in European waters. One of our rules, which we are proud of because it was ahead of its time when promulgated in 1961, and which we still enforce, is that the Federation shall have no restrictions or limitations based on race, colour or creed. One of the functions of the Federation is to stage the European Sea Angling Championships. These championships have been held annually since 1962 and are held in a different country each year. Host countries have included Gibraltar, Scotland, Iceland, France, Norway, Sweden, Denmark, England, Holland and Wales. In addition to the European Championships, European Line Class, Tope, and Cod events are held each year, with the more recent addition of Game and Shore Championships. The Federation is governed by a Standing Committee which consists of the office bearers of the main body together with two delegates from each of the member countries. Meetings are held three times a year in various centres in Europe. There are at present twenty three countries in membership of the Federation and the membership, both individual members and affiliated club members now total many thousands, and is still expanding.